Cabin space is limited, so you need to respond quickly. Reserve your package before December 31st and get a great bonus - 100 rounds of free tracer ammo in the caliber of your choice! So sign up for the Ultimate Somali Coast Adventure Cruise now! Additional cruise information available below. 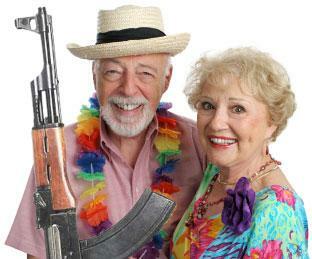 To-The-Point Cruise Lines is excited to offer the ultimate adventure cruise, along the pirate-infested coast of Somalia ! We board our luxury cruise ships in Djibouti on the Gulf of Aden near the entrance to the Red Sea and disembark in Mombassa Kenya , seven adrenaline-charged days later. Reservations start at only $5,200 per-person (double occupancy, inside room) and $6,900 (verandah complete with bench rest). 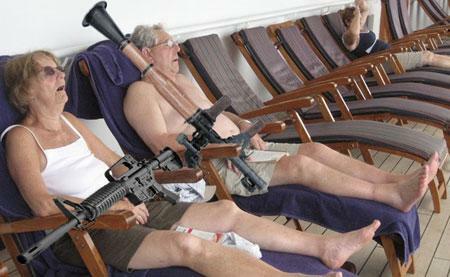 You'll relax like never before! That's because you are welcome to bring your own arsenal with you.If you don't have your own weapons, you can rent them from our onboard Master Gunsmith. The object of our cruise is to sail up and down the Somali Coast waiting to get hijacked by pirates! 7.62 ball ammo at $12 per 100 rounds. affordably priced at only $29.95. rent one today and show you care! "Six attacks in 4 days were more than I expected. Also, our 12-year old son sank two boats with the mini-gun. "Pirates 0, Passengers 32! Well worth the trip! Can't recommend it highly enough!" 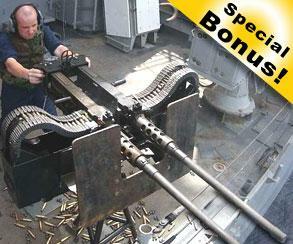 Twin mounted mini-guns are available for rental at only $450.00 per 30 seconds of sustained fire! Need a spotter? Our professional crew members can double as spotters for only $30/hour. Spotting scope included, but gratuities are not. We guarantee that you will experience at least two hijacking attempts by pirates or you'll receive an instant $1,000 refund upon arrival in Mombassa!. And, if you personally participate in the sinking of at least one pirate boat, you will receive a 10% discount on your next booking! How can we make that guarantee? Because we operate at 5 knots, just beyond 12 nautical miles off the coast of Somalia, in international waters where pirates have no rights whatsoever! In fact, we make three passes through the area's most treacherous waters to ensure maximum visibility by Somali mother ships. 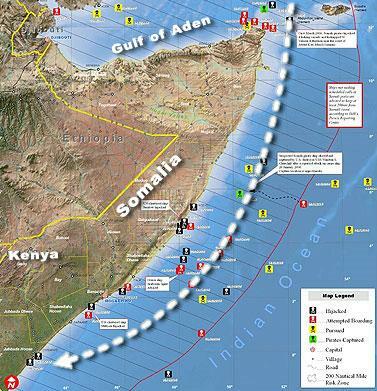 We repeat this for five days, making three complete passes along the entire Somali Coast . At night the boat is fully lit and bottle rockets are shot off every five minutes, with loud disco music blasted toward the shore line to attract maximum attention. Reserve Now -and be automatically entered to win a 5 minute time slot on the Captain's own Twin Browning 50 Caliber M2HB installation!